Welcome Home to Hanna! Located just steps from Main Street on a quiet residential tree-lined street in Vancouver’s Most Vibrant and Eclectic Community. This BRAND NEW never lived in Sunny South-facing two-level townhouse checks all the boxes; whether you are an investor, downsizer, upsizer, or first-time buyer. 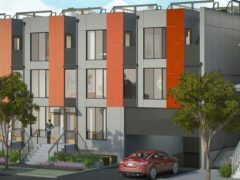 These modern homes are designed by Renowned Birmingham & Wood Architects & Reputable Developer Alpha Beta, and steps from Vancouver’s Best Cafe’s, Restaurants, Shopping & Mount St. Joseph’s Hospital. Features include: outdoor patio, soft-close cabinets, quartz counters, high end stainless steel appliances, glass backsplash, gas cooking, in suite storage, secure underground parking and bike locker. Very reasonable maintenance fees. New 2-5-10 home warranty. Pets and Rentals Allowed!